Is Our Market Poised to Cool or Is the Next Bubble About to Form? In 2016, Alachua County’s real estate market is on pace to have one of its strongest performances ever. Total closed home sales should reach approximately 3000 units, lagging only the halcyon years of 2004 – 2006. The total volume in closed commercial building and multi-family sales rose roughly 36%. It is probably natural for most of us to pause before popping open the champagne, as the scars from the Great Recession are still fresh. One might ask, are we returning to the speculative excesses of 2005 and 2006, a time when most lenders required nothing more than a pulse to secure a loan? We are probably not there yet, but it may pay to be cautious moving forward. Following the improbable election of Donald Trump, interest rates on 30 year fixed mortgages rapidly escalated by over 3/4% of a point as prognosticating, economic pundits proclaimed that an era of accelerating growth and higher inflation were upon us. While this ascension in rates may disappoint present buyers who have not locked their mortgage terms on potential purchases, it is most likely only the start of a larger macroeconomic trend that will lead us to meaningfully higher lending costs over the next few years as the US Federal Reserve continues to tighten its interest rate policies. Murmurs of policy shifts that will loosen financial regulation and talk of reducing or eliminating the home interest tax deduction are starting to permeate political discussions and the public consciousness. Whether or not some of these unknowns come to pass may either save us from overheating or cause a flare up in additional activity. This author suspects that a sense of urgency may begin to ignite the motivation level of those contemplating real estate purchases in 2017. In Alachua County, conditions may be optimal for an exceptional and possibly excessive increase in property values in 2017. Job growth, which is widely considered to be the economic engine that drives population growth, has continued its robust 5-6 year recovery and we have clearly surpassed the old employment peak set in 2007. The existing inventory of homes for sale is at 3.8 months of supply. Condos are at an anorexic 2.2 months of existing supply. A healthy and balanced market is usually thought to have about 5-6 months worth of inventory for sale. Sellers in our market should expect outstanding results over the next 1-7 months. Early birds listing now are already reaping the rewards of getting their property on the market in communities or areas where nothing else is presently for sale. In the interest of full disclosure, this writer personally sold three and purchased one property in 2016. In 2017, buyers in Alachua County may begin to face greater competition and increasing instances of multiple offer scenarios. Will all of this lead to the inflation of the next real estate bubble? Perhaps, but one suspects that additional data provided in this report indicate that there may be a few more years of upside before that transpires. Residential home sales continued to increase in 2016 with the overall number of transactions rising approximately 4.5%. Mean and median home values appear on pace for an 8%-10% annual increase. Inventory has continued a multi-year descent. The average number of days on the market has remained steady at about 2-3 months and the percentage of the original asking price that owners are receiving when selling has increased slightly to about 96.7%. 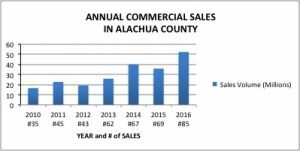 Alachua County is on track for approximately 680 million in closed home sales in 2016. 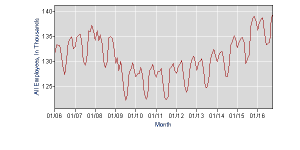 This is about 12% below the 2005 all-time peak of 768 million. It may be rationale to expect further strengthening in sales given the fact that job growth continues to improve and at least anecdotally it appears that our population has been increasing over the past few years. In 2016, mean and median condominium sales prices each rose approximately 15% -16% while inventories hit a paltry 2.2 months. The number of condo sales is on pace to rise 22% to approximately 830 units. Condominiums were the facet of our market that experienced the most gut-wrenching volatility during the last boom and bust cycle. During the boom, some complexes doubled in value between 2003 and 2007 riding a wave of lax lending standards and mob-like demand for condo conversions and new construction flipping. During the corresponding decline it was not uncommon for such communities to drop by 60%-70% in value. At present most complexes have recovered to about 50%-70% of their peak pricing. In 2017 the Alachua County Condo market should continue to experience meaningful strength and appreciation based upon increasing demand, miniscule supply and lending standards that are relaxing but still far more stringent than those seen in the last bubble. Alachua County’s commercial market also had a banner year as many, new, large scale, national tenants opened their doors in projects like Butler North and Celebration Point. Overall commercial sales (with multi-family included) are on pace to increase over 40% in 2016 to over 100 closings versus 71 in 2015. Total volume has improved by 36% to 58.6 million in total sales compared to 43 million in 2015. A major area of strength was office sales, which rose to 41 total units in 2016 versus 17 sold in 2015. The vast majority of 2016 office sales came in the form of small-scale units less than 5000sf in size as many small business owners shifted toward ownership of their own real estate versus leasing. Commercial leasing activity slipped to 140 executed leases in 2016 compared to 166 in 2015. Vacant land sales showed continued strength and are on pace for similar volumes to 2015. This author anticipates that 2017 will be a frenetic year in Alachua County real estate as record-high stock market valuations, a strengthening job market, low real estate inventory and surging housing demand are only partially kept at check by rising interest rates and possible regulatory changes. Are we in the midst of a new real estate bubble? At present the charts and data provided in this report show that we are definitely not experiencing the same irrational sales activity that we saw at the last peak but in some instances the trend does appear to head in that direction. Overall, valuations do not appear unreasonably high yet but it is strongly possible that we are starting a phase where prices in some communities and areas may get frothy and at times excessively elevated. Looking forward, if you are a seller then the market is working in your favor in almost all locations and sectors, but your optimum timeline for the best marketing starts now. Please contact me at perrymcd@aol.com or (352) 262-2871 if you have any questions and I hope you have a fantastic 2017!